The Lope: No Soda for You! The heart of a roadie quickens when stimulated by the spark of unfamiliar neon in the distance. Such was the case when we cruised into Baxter Springs, Kansas, as dusk settled in this past Thursday. We'd seen this new sign - a Route 66 shield above "SODA FOUNTAIN" - at 1126 Military Avenue, on the main drag through "Baxter." 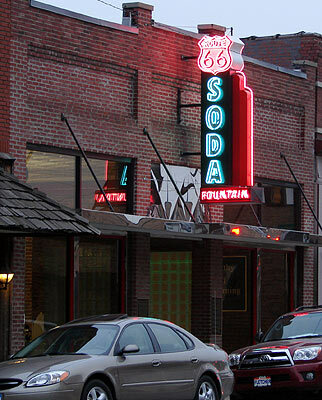 Granted, a neon "Route 66" is a virtual guarantee that the place advertised isn't vintage, but even a retro soda fountain can be cool if done right (no excessive Elvi, please). I was salivating anyway; maybe I'm a bit Pavlovian as when I last saw an unfamiliar sign in this region of Route 66, I got a cool tour. A peek through the window reveals a very nice looking soda fountain - glass brick, if I'm not mistaken - within an otherwise spartan setting, save for the appropriately chequered theme. On viewing the booths across the rather large room from the fountain, I began to notice something odd. All of the customers were very young and there were identical - and really nice - computer monitors in most of the booths. 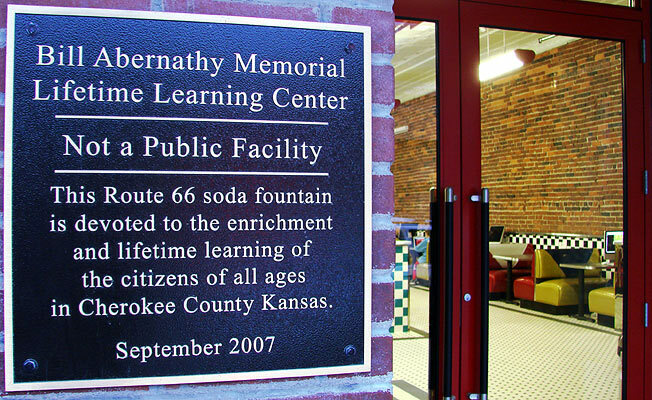 This Route 66 soda fountain is devoted to the enrichment and lifetime learning of the citizens of all ages in Cherokee County Kansas. September 2007? I was surprised I'd not heard of this. I hadn't been to Baxter Springs since attending a Route 66 parade through it in June of last year. I had heard rumors of a soda fountain in Baxter Springs, but no accounts that it wasn't pubic. As I was looking at the plaque an older couple blew past me excitedly and headed for the door. They were quite disappointed when they saw another "not a public facility" sign on the door. The man explained that they'd dined at the nearby Cafe on the Route (where we were headed, too) and were looking forward to an after-dinner malt. When I reached home, I did a little research and the only substantive thing I found was this Joplin Globe article by Roger McKinney, dated October 12 of 2007. McKinney mentions the remodeled 1923 building contains a 1940 soda fountain. "1940 soda fountain" may refer to only the mechanical parts; I think the glass bricks are modern. The article goes on to state that the learning center features wireless Internet and serves middle-school and high-school students in the Baxter Springs, Riverton and Galena school districts. 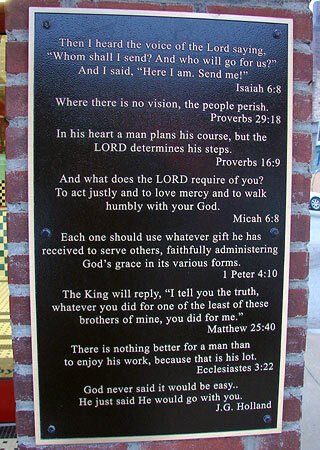 There's no mention of the "citizens of all ages" on the plaque. I phoned the center on Friday and left a couple questions on an answering machine. I'll post if they respond. I do think the student learning center looks like a great idea, and while I love the sign, it does feel a bit deceptive from the perspective of a tourist exploring the town's main drag. 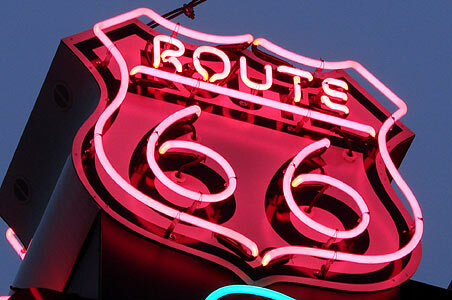 I wonder how they'll deal with the flow of people touring Route 66 this summer, most of whom aren't going to notice the plaque from the street and will be lured as I was, like moths to a neon flame. So, do you think "student of life" counts? I like the idea of using a downtown building decorated to disguise. Here in Augusta, we have some eye-sore buildings in our downtown. We are trying to bring the over-all look back to its "hay day". I am going to pass this on to our Site Committees. Thanks. I think it is a great use of space, and the motive definitely can't be questioned. However, for a community that is trying to lure tourists in via Rt 66 mainia (typo intentional! ), I think it is misleading and could possibly tarnish said tourists' impression of the town! Perhaps different signage could have been used, or different wording. It could still be "disguised" but not prove to be so disappointing to visitors. My family were the ones responsible for making the soda fountain happen. They have always been dedicated to the enrichment of children, especially those with less than ideal home lives. Unfortunately there are many kids in SE Kansas that need the help. If you get "dooped" into going into the soda fountain only to be turned away, quit your griping! It's for a good cause. 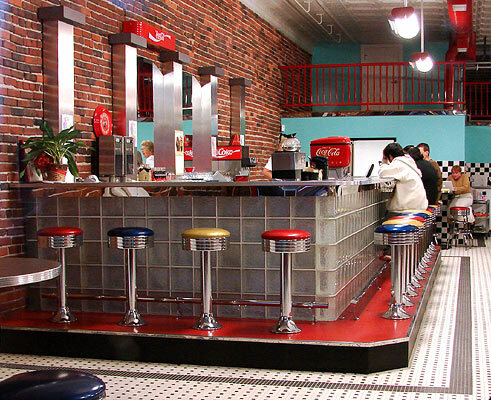 We at the Route 66 Soda Fountain are extremely proud of our facilities and the services we provide to the community. Any tourist who stops is offered a tour of the building and a free Coke although most decline as they more interested in the building than the actual beverage. We have had tourists from all over the world and consider it a learning experience for our students to be able to converse with guests from Australia, Germany, France, Sweden, Japan and Great Britain. When these guests see the students and the great service that we were providing our community, they rejoice with us and say that their community needs something like this as well. 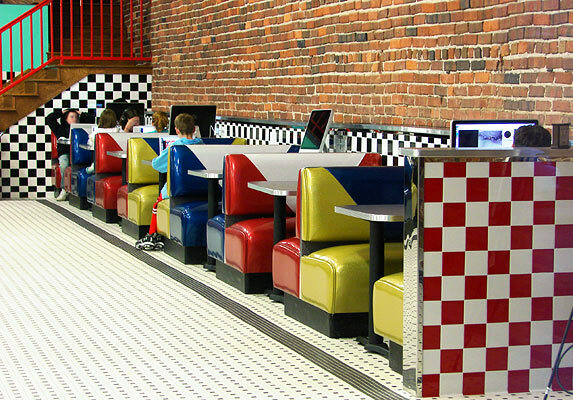 The Soda Fountain is something that is brought into our town too help our children further their education. Not only is the Soda Fountain for children they have GED program. They help all ages. Tourist are more than welcome too come in and tour.. they are not going to be rude and push them back out the doors. We are a very welcoming town, full of people who get very excited when tourist come through too visit. So your next visit.. open the doors and go in.. you might just learn a few things as well. typo, I had heard rumors of a soda fountain in Baxter Springs, but no accounts that it wasn't pubic.